The term “TDS” is an acronym for Total Dissolved Solids when referring to water. This means the amount of ‘inorganic salts’ which can be found in water. Basically speaking, this is anything that contaminates the purity of the water. Some of these solids can cause a huge amount of health issues. TDS salts include calcium, potassium, chloride, sulfates and many more. These end up within our water for a variety of reasons. Water is rarely totally pure, and even natural processes can lead to minerals or other solids ending up in the water. Not all are harmful, but some certainly are. Many solids enter our water supply from human processes such as agriculture, water treatments and even wastewater getting into water supplies. What does a High TDS Mean? A high TDS is an indicator of the quality of the water. Having high TDS doesn’t always mean that water is harmful. For instance, some mineral water has high levels of solids within and this is not seen as harmful, but that is because the actual solids are. These are usually calcium, magnesium or other substances which may not be bad for the body. A high TDS can also be caused by harmful items such as chlorine, sulfates and more. The measurement is a guideline rather than a specific way to tell if water is high quality or not. If the high TDS is down to more harmful contaminants being in your water, it can be a serious risk to human health. High TDS can also mean ‘hard’ water, which is far more likely to cause limescale or other build-ups and deposits on pipes or appliances around the home, shortening their lifespan. The lower the TDS, the better water normally tastes. This varies slightly depending on if water is filtered water from you tap at home, or whether it is bottled mineral water. Though taste is one consideration, health is a much more important one, and is what the acceptable levels are set around. The EPA set the maximum level as 500mg per liter. This means for every liter of water, no more than 500mg should be made up of dissolved solids. There is some debate on the subject, and it alters from state to state. Once again, this is a guideline, and the contaminants themselves are far more impactful than the TDS. The following table shows how the quality of water alters based on the TDS. Guidelines are also different around the world. For example, the scarcity of water with a low TDS in places like India means that the recommended amounts are slightly higher. TDS can be measured via a specially made meter. This should be submerged in the water you wish to measure and will provide a reading. For an accurate reading, do this multiple times from multiple samples which are taken from the same place. With adequate filtration, it is possible to reduce the TDS level to ensure that whenever you are consuming water it is in the ‘excellent’ category. The benefits of this are not only to reduce risks to your health. 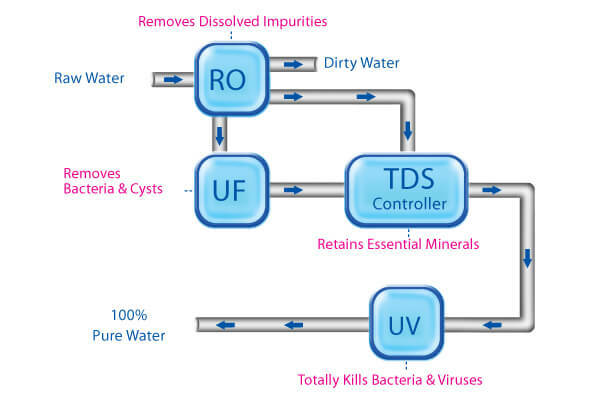 Filtration for TDS usually takes place within a RO (Reverse Osmosis) filter. Deionisation and Distillation can also be used, but these are not as efficient as filtration. In some cases, where the only issues are excess magnesium and/or calcium, a water softener can be used to soften the whole house’s water supply. This is not an effective treatment for drinking water, however it can help to extend the life of you appliances. Reverse Osmosis is a process by which water is forced through a membrane. This has tiny porous materials which allow only the tiniest of molecules (such as water) to pass through. This means that the ‘solids’ will be left behind in the membrane and in the process will have been removed from the water. This leaves you with water which is more pure. For more info, you can visit our RO buying guide.